Today’s news chosen from 90 years ago is not so serious, just a premature prediction in the Washington Post that day by a “British Authority” that Argentinian tango is dead. Tendency of Modern Steps is for Simplicity, Says British Authority. Middle-Aged Dancer Here to Stay, Avers Major Cecil Taylor. Another newspaper from that day shows a fashion that would not be at all out of place today either, except for the black thing the model in the drawing is holding if it happens to be fur. Some of the fashion terminology is quite different as well, with words such as serges, poiret trimmings, and chamoistyn. Besides that though the ad’s overly flowery, often incomprehensible and hyperbolic nature is no different from those you see today. 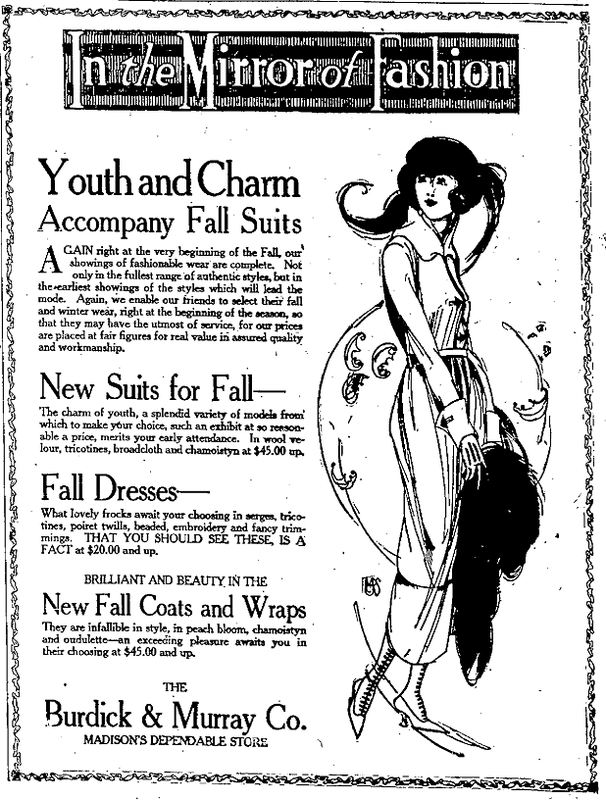 AGAIN right at the very beginning of the Fall, our showings of fashionable wear are complete. Not only in the fullest range of authentic styles, but in the earliest showings of the styles which will lead the mode. Again, we enable our friends to select their fall and winter wear, right at the beginning of the season, so that they may have the utmost of service, for our prices are placed at fair figures for real value in assured quality and workmanship. The charm of youth, a splendid variety of models from which to make your choice, such an exhibit at so reasonable a price, merits your early attendance. In wool velous, tricotines, broadcloth and chamoistyn at $45.00 up. What lovely frocks await your choosing in serges, tricotines, poiret twills, beaded, embroidery and fancy trimmings. THAT YOU SHOULD SEE THESE, IS A FACT at $20.00 and up. They are infallible in style, in peach bloom, chamoistyn and oudulette — an exceeding pleasure awaits you in their choosing at $45.00 and up.